"I can make it complicated for you if you want. I'm good at that." So says Mary as she sets me up on her iPad to write the trip report. There’s no need for that. Things get complicated soon enough. 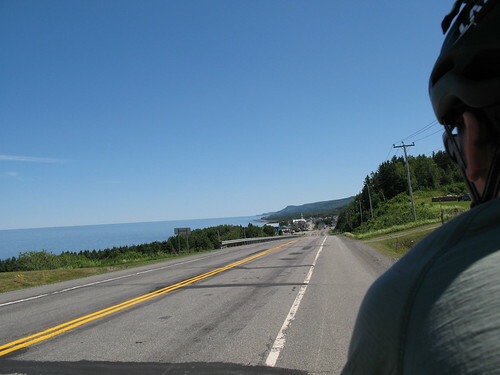 Our ride this year is a trip around the Gaspé peninsula, a rocky protuberance at the mouth of the St. Lawrence River (on the right hand side when looking at a map of Canada). 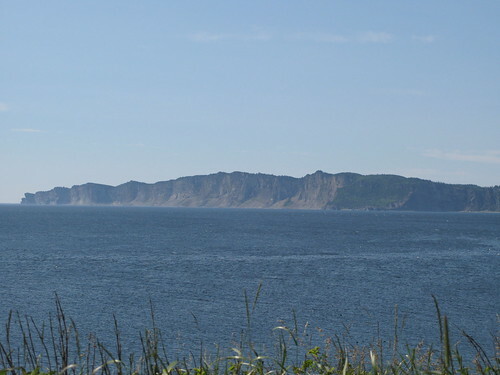 If a doctor said “Say ahhh” and stuck a tongue depressor down Canada's throat, the Gaspé would be Canada's tongue. 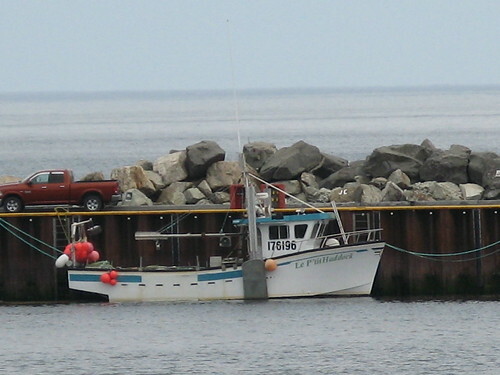 The Gaspé is one of the oldest areas of North America to be settled, where the distance between fishing villages was measured in oar strokes. 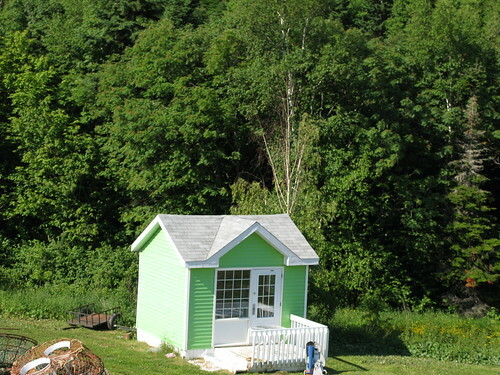 Probably only Newfoundland has the same rich history of isolated development. 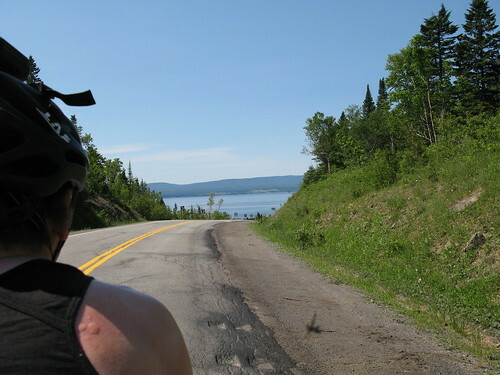 The province of Quebec actively promotes cycling tourism. 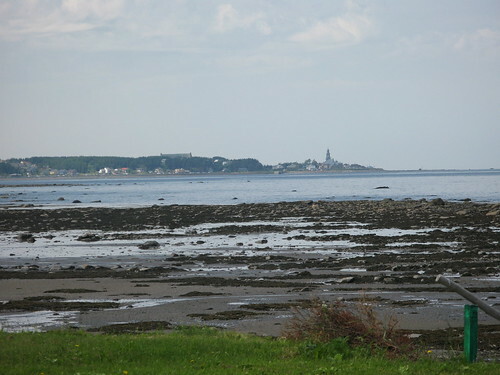 It publishes a network of cycling routes, the Route Verte, of almost 5,000 kms. These routes are mapped and the highways signed. A published book lists distances and cycling-friendly accommodation. Some day the rest of Canada will catch on to the concept that being cycling-friendly can have an economic benefit. We were supposed to start in St. Flavie, but the car put paid to that. Our alternator gave up the ghost enroute. Here are the systems that depend on a car battery: radio, iPod charger, odometer, tachometer, headlights, turn signals, emergency lights, air conditioning, windows, accelerator. But not the brakes. 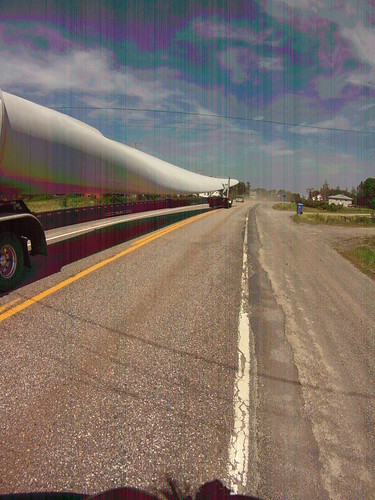 A new battery purchased in Riviere du Loup got us as far as Rimouski. Things just got a bit more complicated. The car was left at the local Rimouski VW dealer with a note in execrable French. "Le fixez, s'il vous plait". "You kind of get stiff first day out." Indeed. It was down to the seashore and the smell of salt in the air. It was a delight. 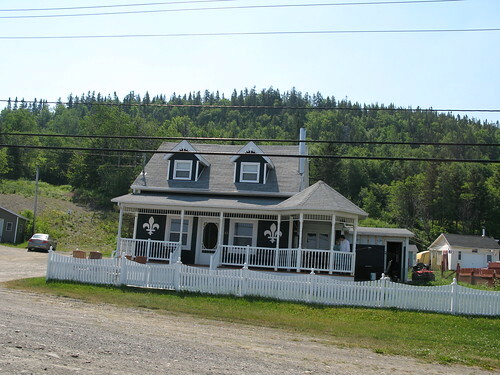 Small Quebecois villages were indistinguishable from one to the next. Small houses, large houses, some in decay, some brightly picked out in primary colours were in abundance. Traffic was slow, and where the route moved to a busier highway there was a broad, bold shoulder for our pleasure. The road was gentle, the climbs were gentle, the wind was on our quarter, the sun shone down. A pair of oversized deck chairs announced the Jardins de Metis as a lovely lunch stop. Recommended. It was a perfect first day of a tour. That evening we sat on a tiny terrace with a bottle of beaujolais and a gorgeous Quebec cheese, Le Noble. Brie, eat your heart out. The waves washed up on the beach, the gulls cried in the distance, and we struggled to stay awake for dinner. The Quebecois have a joie de vivre as well as a superb culinary tradition, and our motel had an excellent dining room. Sweetbreads with a maple syrup sauce may have been the best dish of the trip (we detected a slight flavour of baked beans in the sauce). Across the bay, on the north shore of the St. Lawrence, a peak revealed itself – it would be a formidable climb – and then disappeared again. Forest fires were raging in northern Quebec, covering the south and west in the haze. 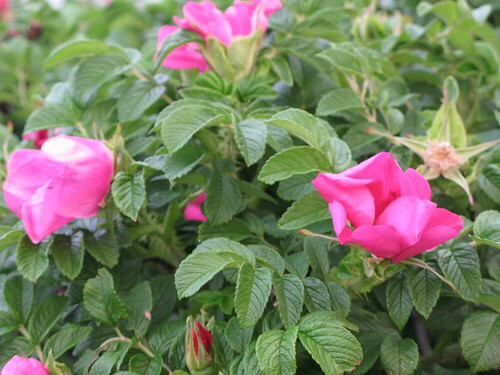 The smell of roses wafts across the highway as the breeze crosses our path. The morning winds are from the north; by midday they change from the west and we have a tailwind. There is a haze in the air from forest fires on the north shore; in the distance we can occasionally see the outline of the distant mountains across the gulf. Someday I want to see that shore. 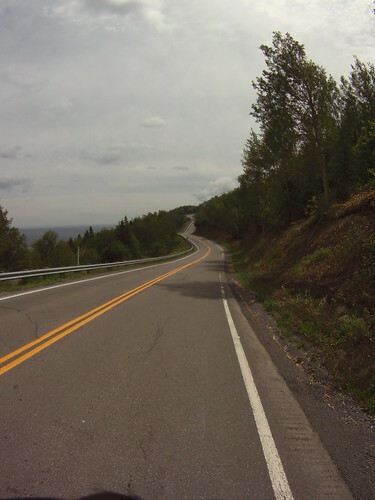 The shoulder on the highway was good until Grosse Roches, and then it deteriorated further. I feared we would loose our comfort zone, but the scenery promised to become more dramatic. 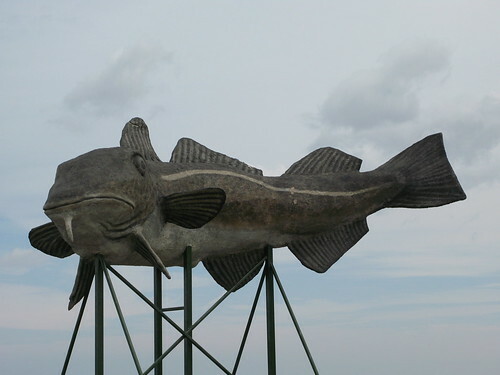 The Route Verte follows the official highway 132, but we detoured down into the small towns that follow the old road. The villages were not as well maintained as yesterday; we felt we were moving to a poorer part of la belle provence. I found a use for Mary's clothesline. Our gears were slipping, particularly the ninth gear. 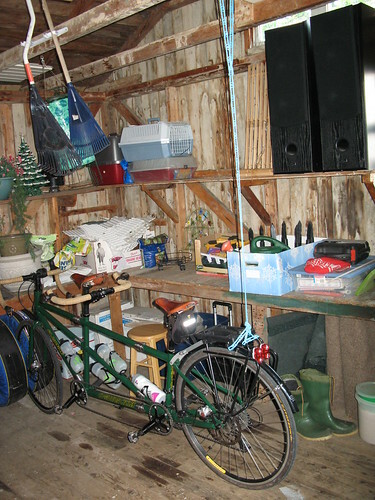 In the shed of the B&B, I suspended Lady Como from the rafters using the clothesline and wedged the front wheel between two snow tires. For a half hour I was able to play with cable tension. The clothesline now moves from the touring category of “domestic superfluity” to “maintenance necessity”. 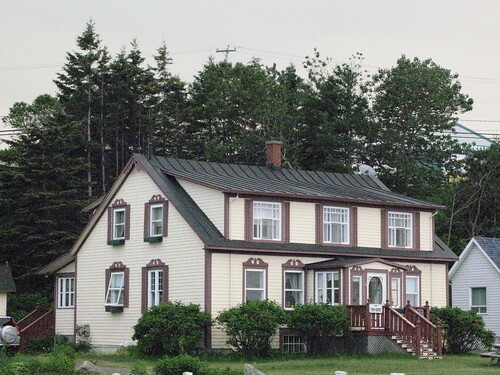 Our B&B was built in 1836, which is old by Canadian standards. The doorways are short enough that Mary feels tall walking through them, i.e. they are very short. I almost have to duck. Days are longer as we slant north. 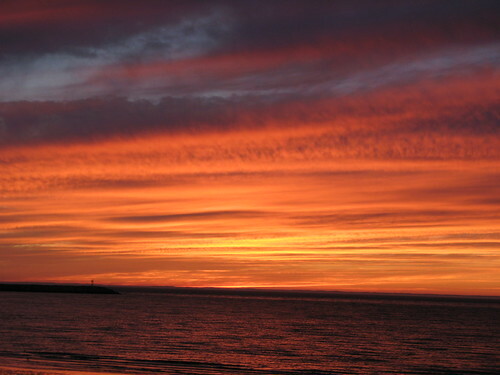 The sky is bright by four in the morning, with long, gentle dawns. May the good weather hold. The breakfast conversation with our B&B hostess, Denise, was interesting. The Gaspesiennes are very independent and proprietary. Denise, who was born in the eastern townships and moved to Gaspé a dozen years ago, is still called etranger (stranger). There isn't much employment here. 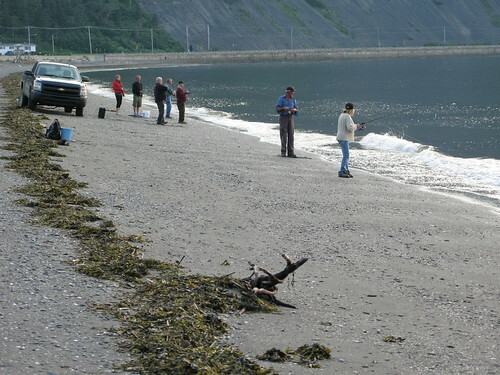 The tourist season lasts for two months, and otherwise fishing is the main employment. In winter there is not much to do. 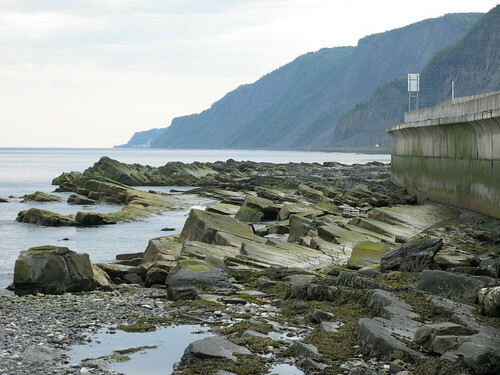 The Gaspé, like many of the regions, is fiercely separatist. This is an undercurrent in Canadian politics that resurfaces every couple of decades. The road hugged the shore almost all of the day. Side roads through the villages kept us close to the shore. The mouth of the St. Lawrence widened and we could no longer see the north shore (though an occasional whiff of woodsmoke still comes from the forest fires). There are no gentle hills sloping away from the road. 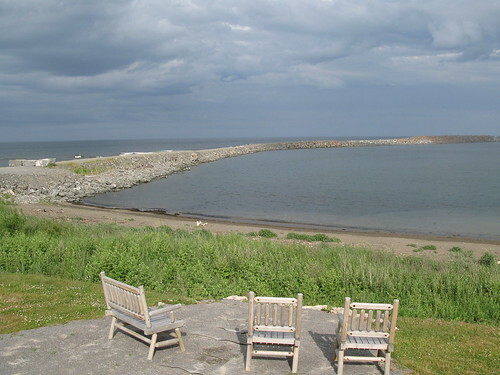 The shore is iron bound by black cliffs. Villages nestle in the pockets of coves, strung along the length of the strand and then end abruptly. It is a land of hard times. The wind misbehaved. It is supposed to blow from the west in the afternoons. The afternoon turnaround did not happen. We rode against headwinds all day. Highway construction gave us a break. Traffic was held up in one direction; we were able to scoot ahead and then traffic passed in bunches. Our distances are mild. 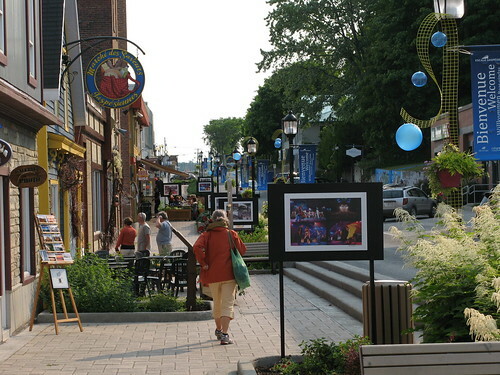 We are following the recommendation of the Quebec tourism office. It's better to have distances that are too short than too long that wear you out day after day. Still, we could easily slip in an extra few kilometers. My French sparkled. Yesterday I asked for a knife and got a spoon; today I ordered fish and got chicken. 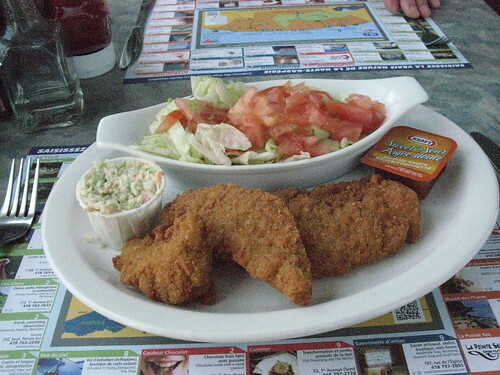 Mary had cod tongues for supper – she was a happy camper. “Be careful, the road is difficult ..." (opening words in the tourist board description of this section of the route). This was the first day of truly significant climbing. It rivaled the Spanish Pyrenees for effort. 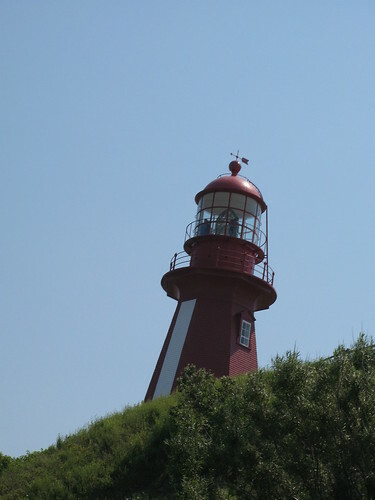 We had a light lunch at the lighthouse of Riviere Madeleine – homemade soup and cookies – before hitting the climbs. The climbs were not long – there is one climb of 11 kilometers perhaps – but the gradients were brutal, often over 10% and sometimes peaking above 15%. What was probably worse was that the road is a tease. It levels out to make you think you have handled it, then turns a corner to continue upward under the noonday sun. The descent into Grand Vallée has a truly spectacular lookout – it is hard to imagine a more dramatic setting from a distance. 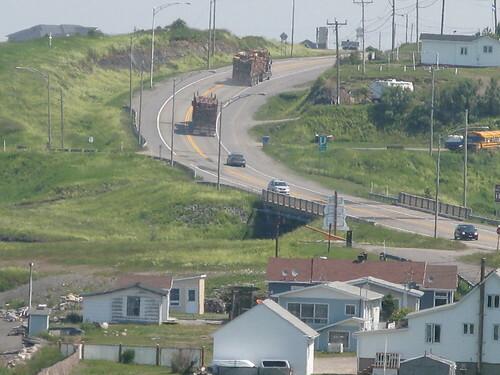 From close up, the town looks tired and dusty, though at least they have a sawmill for employment. Cycling and food are natural soulmates. At night I am reading Dearie, Bob Spitz’s biography of Julia Child, to Mary. "It better rain today. Otherwise, why did we bring all this stuff with us?" Be careful what you ask for. The wind changed overnight and came up fiercely in the morning. With luck it would be at our backs all day. At an unnamed village we took a detour into town and lay down in the grass overlooking the quay. This is truly one of the joys of cycling – lying back on a grassy slope, listening to the surf and catching 40 winks in the middle of the afternoon. The day’s climbs were not as long but every bit as tough, mostly because of those momentum-sucking gradients. Ten percenters were standard, twelve percents were not uncommon, and there were a few fifteen percents just to keep life interesting. The worst was the last climb of the day out of Petit Cap. It rose up like a solid wall, it was ugly to look at, and it stayed ugly all the way up. Of course, once at the top, it dropped right down into the next village. 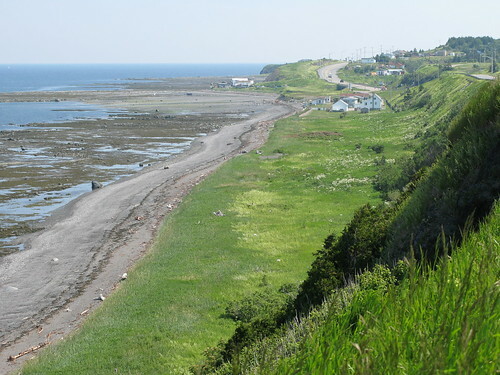 We are now on the section of the Gaspé that is not a designated part of the Route Verte. I was concerned about this section when we were planning the ride, but I think the climbs are the reason why it is dropped. 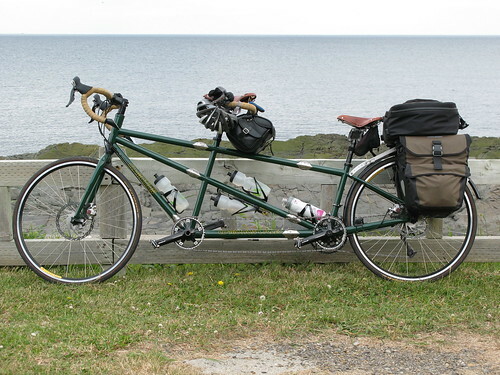 For a casual cyclist these would be brutal, but if you are an experienced tourer it is a real pleasure. Just be sure you have the gears for climbing 🙂 . The highway was generally been somewhere between very good and excellent, with nice wide shoulders (although there are older sections that have to be negotiated). When is a national park not national? When it is in Quebec. Canada has a superb collection of national parks that are administered by the federal government. The provinces have provincial parks, all except Quebec which insists that its parks are "nationale", i.e. part of the "nation of Quebec". This same concept extends to the Quebec National Assembly (as opposed to provincial legislative assemblies); to the title of the "First Minister" (rather than Premier), and countless other designations that convey a "national" status. This is more than a conceit. In my lifetime there have been kidnappings, murders, the imposition of martial law, constitutional crises, and referenda in the name of separatism. A vote to separate failed by less than 1% in 1998. Canada may be boring, but it is not benign. Language typifies this attitude of uniqueness. If, say, you were to emigrate to Canada and settle in Quebec, your children would be educated in French regardless of your mother tongue. You would have no choice. It is the law. If you have a business and hang a sign outside your door, it must be in French, with a French name. English is permitted in some instances, but must be beneath the French and in a designated smaller font. It is the law. When is pasta not pasta? The language police (yes, there are language police), recently ordered an Italian restaurant in Montreal to change the word "pasta" on its menu because it was not French. Here is a history of Canadian Anglo-French relations in five steps. 4. The social, economic and technological upheavals of the 1960s foster a strong current of Quebec nationalism which reach fever pitch with Charles de Gaulle’s 1967 declaration “Vive le Quebec Libre!” from the balcony of Montreal’s city hall. FLQ militant separatists kidnap and murder; Pierre Trudeau orders the army into the streets. 5. 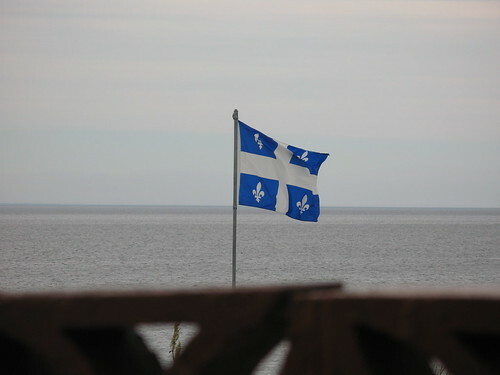 The separatist Parti Quebecois forms the government in Quebec. Truckloads of money (literally) move from Montreal to Toronto, firmly establishing Toronto as Canada’s business capital. That was seven steps. It was a bit more complicated than I thought. Hint to a cyclist: try to have a little bit of french in your back pocket. It goes a long way with the locals. The ride started beautifully. There were a few hills to start, but by L'Anse au Griffon we fairly sailing up them, fortified by a strong tailwind that literally blew us along. 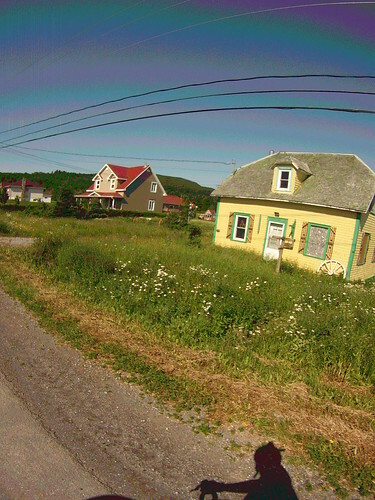 The road runs right along the shore, past old Quebecois houses painted in rainbow colours. Then we turned inland to cross the national park, and at this point the pavement literally crumbled underneath us. I was severely disappointed. Any Canadian national park I have visited had superb road conditions. The climb across the peninsula was a grind, with little remarkable in the way of scenery and hills that were a drag. 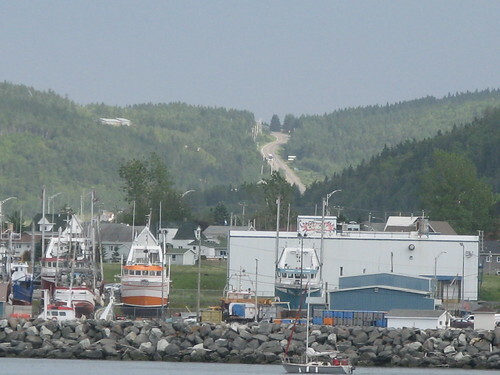 When is Gaspé not Gaspé? When it is Fontenelle, which we passed one hour and three climbs before the end of the day. 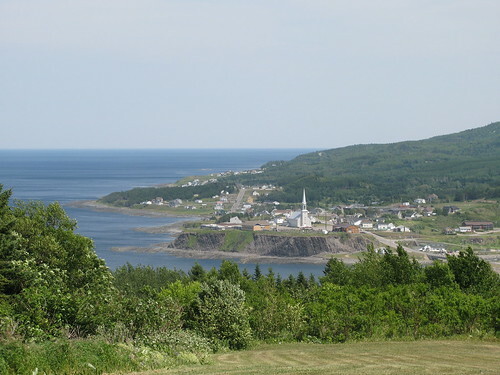 The village of Fontenelle was amalgamated into the larger Gaspé municipality recently. Our hotel for the night was booked there. On the hotel bookings site it shows in the searches as part of Gaspé – not much use to a cyclist. I guess we will not be staying there tonight. Yesterday the warm weather brought out the horse flies with their forks and knives. Is anything more aggravating then climbing a hard hill while someone is sawing into your back? We were, to them, a moveable feast. Posted by Kern on August 1st, 2013. Well done. This comes over as cycle touring in a foreign country and all the better for it. The historical perspective is interesting. Having just read (most) of Wikipedia's Quebec page, as well as this report, I'm now better informed, except that the background seems complex to a European. Language is a powerful driver for autonomy. What is the French word for 'pasta'? (is it pâtes?) I could understand objections to an English word, but not Italian 😕 . At least the secondary wording on notices can be in English. In the Flemish-speaking region of Belgium (my mother's native country, although she was French-speaking, and so am I) French is not even the second language taught in schools. I have never felt any desire to visit the USA but I'd like to see Canada one day, or parts of it. That is 'we' as Sandra has a cousin in Toronto whom she has been threatening to visit since ages. Whether she would take to cycling exclusively on highways I am not sure, but I suppose we might try! Good photos. 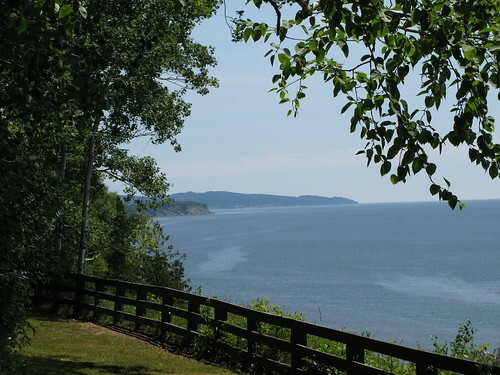 The north shore, especially, looks lovely. 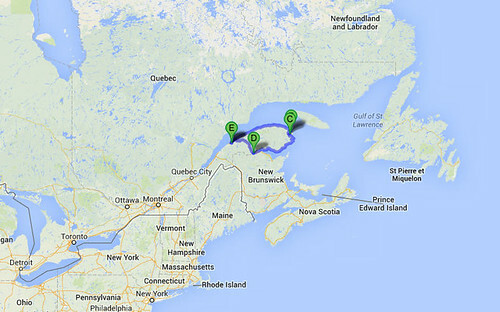 That looks like a cracking tour and, as Patrick says, the north shore looks lovely. I have to admit that I know absolutely nothing about the geography or history of Canada, I suppose because unlike its neighbour, it tends to keep itself to itself. 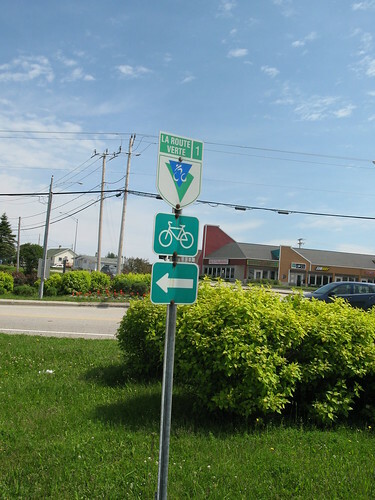 Anywhere that has signs welcoming cyclists must be worth a visit! You are a brave man, taking on Quebec history! Let me know when you have figured it out 🙂 .